Nottinghamshire Outlaws continue their T20 Blast campaign this weekend with games against Derbyshire Falcons and Northamptonshire Steelbacks. Then the Friday after, 3rd July, table-toppers Worcestershire Rapids visit Trent Bridge – and you could win one of five pairs of tickets for that game in another of our super competitions. 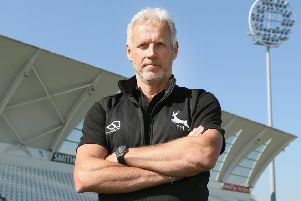 Notts have not made the best of starts to their T20 campaign, winning three and losing four of their opening seven games to sit in the bottom two. But the table is very tight and two wins this weekend could push them back up in contention once more, the Outlaws currently sitting just four points behind the Rapids. Notts last week gave a debut to Australian international T20 specialist Dan Christian and this weekend’s double header marks an opportunity for him to make his mark. “My role is to play the situation when I come to the crease, but I do like to take a few balls before getting going and hopefully I can do that when searching for the victory this weekend,” he added. “T20 is a momentum game and you find that if you win one, you can go on a run of positive results and move up the table. “The group is really tight at the moment and we are only one win off the top three, so a couple of good performances can change everything. Which England batsman is back with Notts T20 squad this weekend after returning from international duty against New Zealand? Enter by email via sport.nmsy@jpress.co.uk by noon on Monday. First names out the hat win the tickets. Usual Chad competition rules apply and are available on request.